As a result, the packaging sector has seen a shift to shorter run lengths, expanded packaging formats, premium/innovative packaging, and digital printing/graphics. Packaging converters that can stay ahead of these and other emerging trends face very attractive opportunities for growth. An uptick in new product launches, along with increased private-label/Tier 2 brand participation, is among the key trends driving brand-mix shifts in the consumer packaged goods (CPG) segment. In addition to boosting packaging demand (even through periods of lower economic growth), the rise in product updates resulting from increased SKU proliferation has in turn led to shorter run lengths across numerous categories, while also emphasizing the need for more innovative product packaging. Despite recent gains, private-label/Tier 2 brands remain underpenetrated in the U.S. relative to other markets. At present, domestic private-label spend stands at 18%, compared with an average 27% in the EU (including 40-45% penetration in Switzerland, Spain and the UK). This suggests significant room for growth among smaller brands, and we expect that private-label/Tier 2 brands will continue to cut into Tier 1 market share in many food/beverage and non-food/beverage categories. To counter this, Tier 1 firms are eyeing newer solutions, such as digital printing for use in specialty runs associated with tailored marketing campaigns (e.g., Coke). In this Executive Insights, L.E.K. Consulting outlines the key trends that are driving demand for higher-value packaging products. To succeed, packaging converters must be cognizant of shifts in CPG trends and their likely impact on different product categories; further, they must be nimble enough to develop innovative packaging solutions on behalf of CPGs as they strive to meet consumer demands. For investors, understanding how these trends are driving mix shifts in packaging substrates and formats, as well as where higher value-add products are being developed, is key to identifying opportunities in the making. Microsegmentation of consumers driving product launches: As CPGs tailor new products/product extensions to specific consumers, the number of new brand introductions and SKU extensions in the market has risen sharply and continues to increase. Increasing promotional activity: With more products vying for shelf space, brand owners among CPGs have expanded the scope and increased the frequency of their promotional activities, including offering limited-run product variations geared toward special events/seasons. 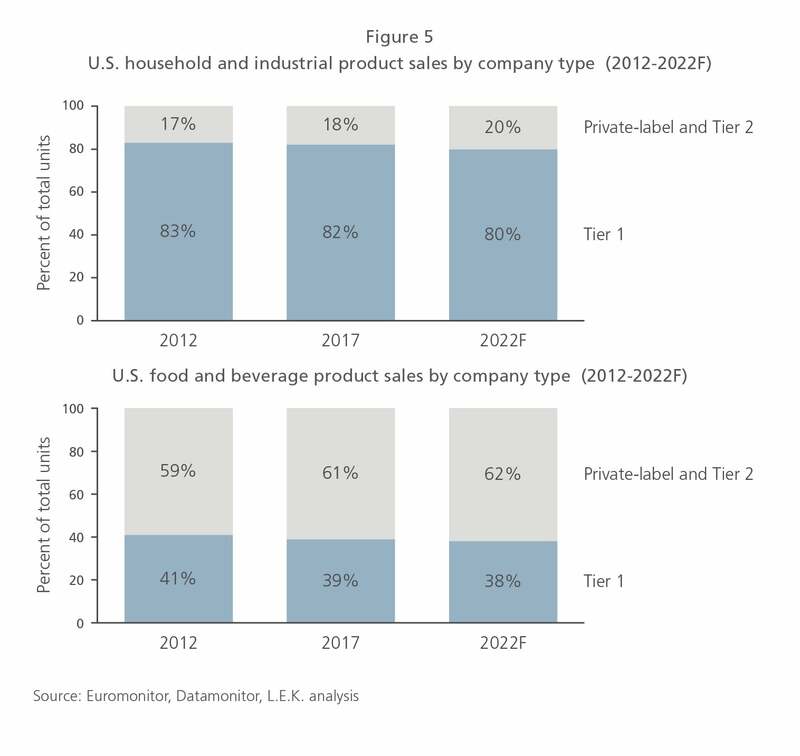 Private-label/Tier 2 brand share growth: The expansion of the private-label/Tier 2 market has also driven SKU counts as well as increased demand for innovative packaging as private-label/Tier 2 brands compete more directly (e.g., at similar price points) with Tier 1 brands. 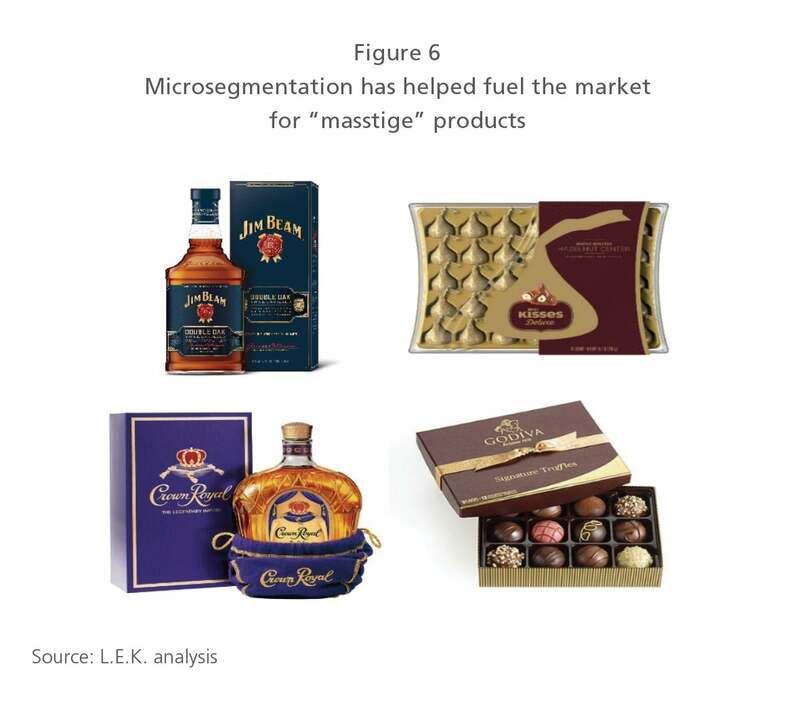 Prevalent in many end markets, but especially in the cosmetic, beverage and confectionery segments, masstige products allow brands targeting the mass market to advance the perception of quality using premium packaging designs. A record number of product launches by CPGs across end markets has been a key driver for North America’s packaging market (see Figure 1). During 2016 some 40,000 products came to market, more than twice as many as in 1998, led by smaller private-label/Tier 2 brands as well as products from larger CPGs targeting specific consumer segments. Growth in non-food product launches was particularly robust, nearly tripling through the period (to around 18,700 last year, compared with just 6,500 two decades ago). By microsegmenting consumers to more acutely address their needs, CPGs have developed an ever-expanding array of sub-brands, product extensions and new SKUs (e.g., not necessarily a product extension but a new packaging format of an existing product), each requiring its own packaging. 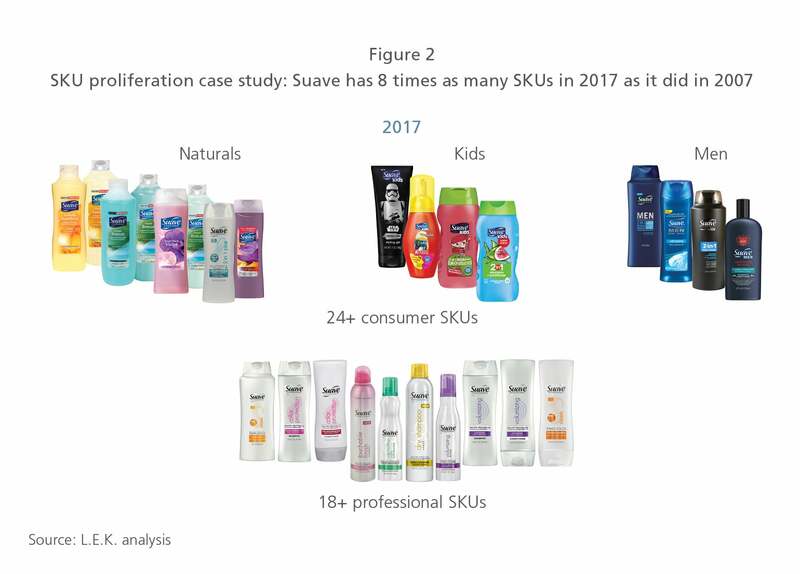 As an example, shampoo maker Suave now has eight times as many unique SKUs as it had in 2007 (see Figure 2), while the growing popularity of ethnic foods has led a number of CPGs to experiment with distinctive brand flavors (such as Lay’s Brazilian Picanha, Chinese Szechuan and other varieties), each of which has unique packaging. CPGs consider brand, product and SKU extensions to be a strategy to gain market share, particularly through market cycles. L.E.K.’s recent Packaging Survey indicates that during periods of slow economic growth, brand owners think of entering more channels with channel-specific products and SKUs and introducing “value” sub-brands as their primary strategies. 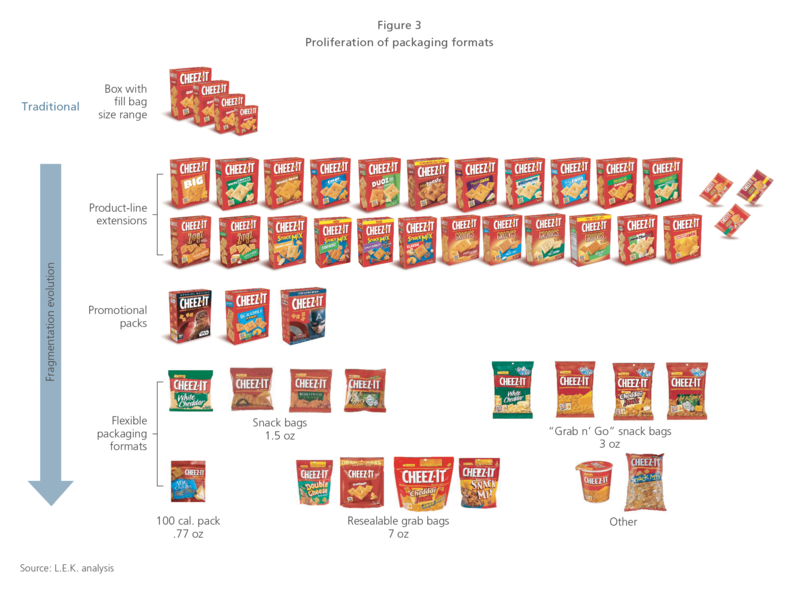 The proliferation of new brands and products and SKU extensions has not only impacted the printing on the packaging (there is now a greater variety of labels in shorter run lengths), but it has also resulted in a proliferation of packaging formats (see Figure 3) as CPGs look to differentiate their products in and across channels. Based on L.E.K.’s Packaging Survey, brand owners expect to increase the rate of new product and SKU extensions over the next five years relative to the last five years, though they plan to slow the introduction of new brand extensions. In addition to brand, product and SKU extensions, CPGs are increasingly using seasonal or event-driven promotions to differentiate their products. In the L.E.K. Packaging Survey, 68% of CPG respondents indicated that optimizing their promotional activity was responsible for their brands’ success over the past few years, and that promotional activity was expected to increase at a similar rate going forward. 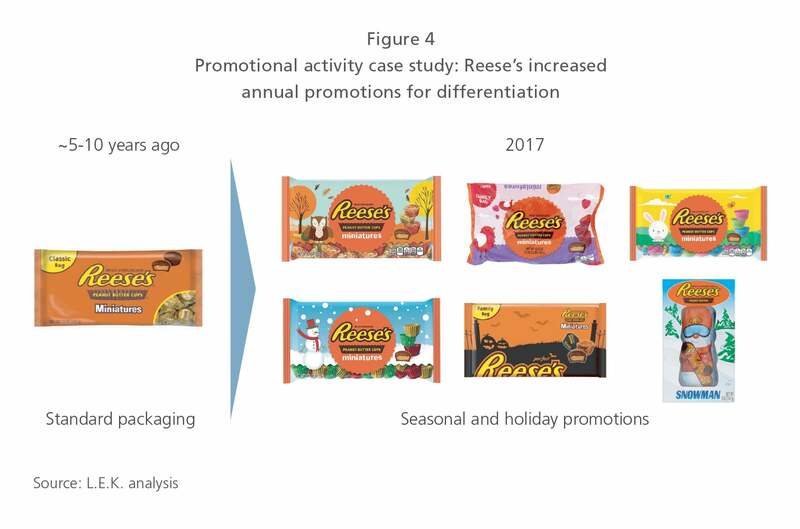 As an example, Hershey’s has dramatically increased the number of seasonal or holiday-based promotions, including six different seasonal/holiday periods for its Reese’s peanut butter cup line (see Figure 4). In another example, as a tie-in to NFL Week 1, Budweiser used customized packaging to create individualized Bud Light cans bearing the insignia of a target market’s hometown team. Promotional activity has driven a demand for shorter run lengths in printing capabilities, which has driven demand for digital printing in particular. CPG respondents to the L.E.K. Packaging Survey indicate that short runs in labeling have been a major trend over the past few years, driven particularly by promotional activity, and are expected to increase in share relative to medium/long runs over the next five years. 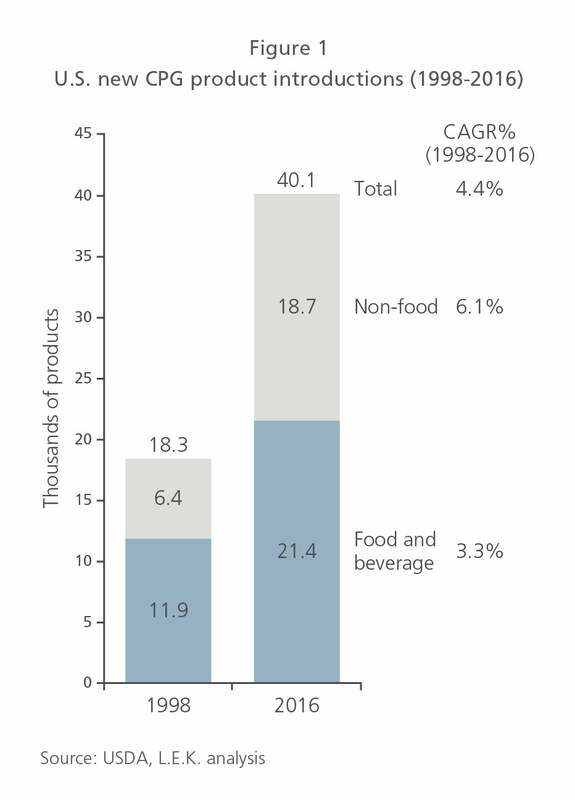 While national and international Tier 1 brands continue to lead the market in household and industrial product end markets, by contrast, private-label and Tier 2 brands have the lion’s share in food and beverage end markets, accounting for some 60% of market share at present (see Figure 5). L.E.K.’s Packaging Survey indicates that private-label brand owners have been and are expected to be more aggressive than branded CPGs in terms of new product and SKU introductions over the next five years. And private-label brand owners are increasingly spending more on their packaging needs, according to the Packaging Survey; more than a third of private-label brand respondents indicated that packaging was “most important” to their brands’ success. One of the strategies used by Tier 2 and private-label CPGs is to invest in premium packaging as they upgrade their product lines. In fact, some private-label brands, in particular, have unveiled their own premium product lines similar to those marketed by Tier 1 brands. North Carolina-based supermarket brand Harris Teeter, for instance, offers a variety of “own brands” that range from traditional fare to upscale (HT Traders) and organic products (Harris Teeter Organics). The market shift toward Tier 2 and private-label brands has in turn helped drive new product introductions and packaging needs. For example, above-average brand, product and SKU fragmentation has made food and beverage companies, along with electronics, pharma and personal-care providers, among the leading users of digital print services. Though pricier on a per-unit basis, the compact production cycles make digital printing economically feasible for these smaller brand owners, allowing them to offer a wider range of short-run products and, in turn, take on much larger competitors. Prepared-food maker Bear Naked Granola utilized digital printing for its individualized granola blends and package designs; since its inception in 2012, French baby food startup Yooji has brought to market more than 20 different SKUs through limited digital print runs, exceeding initial sales forecasts in the process. Microsegmentation has also helped fuel the market for masstige products — premium brands that participate in the mass market and associated channels and that want to present a premium look in their packaging. Examples include mass-market liquor brands such as Crown Royal or Jim Beam that are offered in attractive, folding cartons similar to those used by higher-end distilleries; confectionery brands such as Hershey’s have also relied on premium packaging in order to convey a look commensurate with the luxury chocolate set, e.g., Godiva (see Figure 6). Across end markets, CPG brand owners say that introducing “value” brands, products and SKUs in specific channels has been a major initiative over the past five years, according to the L.E.K. Packaging Survey. Going forward, CPG brand owners indicate that increasing the premium/luxury look and feel of their packaging will be a significant move, which explains why more than half of CPG brand owners surveyed expect their packaging spend to increase by up to 10% over the next year. One angle that CPG brand owners have adopted to upgrade their packaging to a premium look is to move toward the category of sustainable packaging — packaging that is either recycled content or biodegradable. While part of the trend toward sustainable packaging is driven by many CPGs wanting their packaging to reflect new product reformulations that are “green” or “healthy/ all natural,” many CPGs are using sustainable packaging simply as a form of innovation to help differentiate their product. According to the Packaging Survey, green and healthy/all natural product derivatives have been the predominant drivers of brand growth across end markets (e.g., beauty and personal care, healthcare) over the past five years, and going forward 60% of CPG brand owners who responded to the survey indicated that they plan to shift a portion of their packaging needs toward sustainable packaging products. Long-term trends driven by CPG brand owners — across end markets, including food and beverage and non-food and beverage — are generating demand growth for packaging. As consumer spend has become increasingly fragmented across a range of brands, products, SKUs and retail channels, brand owners have relied on packaging to improve product appeal and create differentiation. The impact on packaging has been that the sector has demonstrated growth through innovation and mix shifts and that such growth has shown resiliency even during periods of low economic growth. Over the near term, the packaging sector faces a number of key trends: ongoing brand, product and SKU fragmentation will continue the trend toward shorter run lengths, while the variety in packaging formats is expected to grow as well. Heightened promotional activity will lead to substantially shorter label life cycles while at the same time increasing the iteration of packaging changes. The ability to convey product quality through premium packaging has been important for different reasons to Tier 1, Tier 2 and private-label brands, and the need to produce innovative, functional and eye-catching packaging is driving CPGs to spend more on their packaging. Packaging converters must continue to stay a step ahead of emerging CPG trends and meet the growing demand for differentiated packaging (in terms of substrates, formats, closures, etc.) and production flexibility. But opportunities for growth in the packaging sector abound as pricing and unit spend on packaging look very attractive going forward.